This quote, usually attributed to Winston Churchill, implies that this trip is a difficult journey. No one wants to get stuck in hell. Newsflash: We don’t get out of this life unscathed. There are any myriad of reasons for taking a trip through hell..addiction, loss, mental health issues, poverty, illness, life transitions, just to name a few. Sometimes there are a variety of reasons. And often people take this trip more than once. Hell looks different for different people. There are some similarities, but your travel agent arranges the details of your trip through hell, tailored to your very own individualized specifications; Usually these are geared in the service of…here’s where it gets tricky…we may not know the answer. In retrospect, the reason for your descent may make itself clear to you. And sometimes you may not find out. Usually, this trip is in service to your increased consciousness. Your willingness to look at what’s going on, often can help you with the “why”. Just like any trip, it can last a long time or a relatively short period of time. It’s usually a fairly intense journey. I mean, it wouldn’t be called hell if it wasn’t, right? Lots of people want to avoid taking this trip for as long as “humanly” possible. Often they will cling to distractions, defense mechanisms, anything not to have to face….what lies beneath the surface of their pain. People want to feel good. And, we want to feel good… now. Instant Gratification. What kind of guarantees? They want to know that the trip ends. 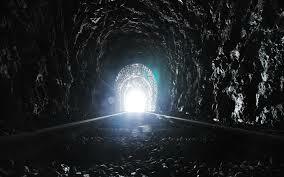 That there is light at the end of the tunnel. They want assurances that they will make it through this dark night of the soul and/or to be assured that things will work out for them the way they have planned. There are however, a few things that you can do to have a better outcome. Think for a few minutes about what you do before you leave for somewhere you’ve never been before. You can talk to other people who have been there, right? They may have some good advice. You may not believe what these people tell you. That’s okay, it’s validating just to know that others understand and have been there. Talking with people who are supportive and know what you are going through is definitely helpful. Asking for help. There’s a caveat to this. When going through hell, and asking for help, it’s important to go to someone who can actually be helpful. Sometimes its hard to know who this might be. There may be a period of trial and error. Maybe you might get stung a few times in order to decipher the helpful people from the unhelpful people. Unhelpful people are untrustworthy, deny or minimize what you are going through. Maybe they make fun of you, or want to take advantage of you in some way while you are vulnerable. Or perhaps they just ignore you. Have you ever stopped to ask directions and immediately get that feeling that… this is probably not a good place to stop? What would you pack in your travel bag for a trip through hell? What would you want to pack? Some self care? Courage? Maybe a way to ground yourself when feeling threatened? Perhaps you’d like to arm yourself? How about a shield? Oh, how about…a special suit that you can zip up and that would provide you with a personal boundary for the inclement weather you might encounter? You probably have some of your own items you’d like to pack. Sometimes I would do the following creative arts therapy group with folks who were struggling with eating disorders. (It works with many groups whose members are going through a difficult process). First, I’d provide various art supplies and ask members to get quiet. Centered. The directive would be to: Use whatever type of materials you want to create some sort of tool, device, etc.. that you imagine will help you while you are going through your recovery process. No matter how careful you may be or what precautions you take, we all experience painful times in our lives. Believe it or not, there are some positive outcomes. One of these is an increased appreciation for your life. Other benefits sometimes include increased empathy, better relationships and/or a stronger spiritual connection. Sometimes recognizing these benefits is helpful for giving people a bigger, brighter perspective. If you are going through hell, what would you create that would help you on your own journey?